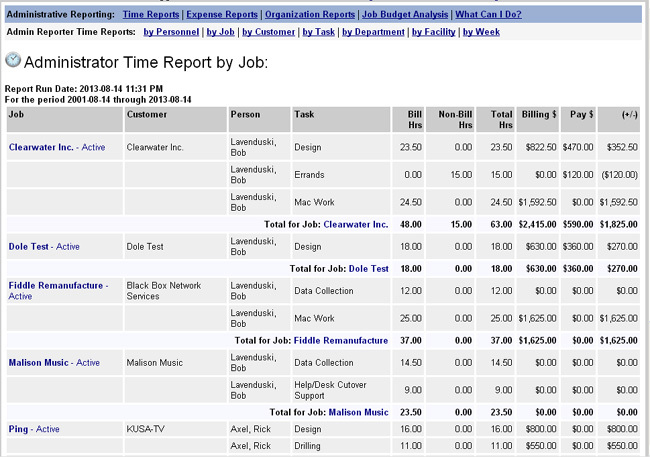 Run personnel time reports by person, job, customer, task, department, and week. You can also select a weekly summary layout, or choose a time frame between any two dates. 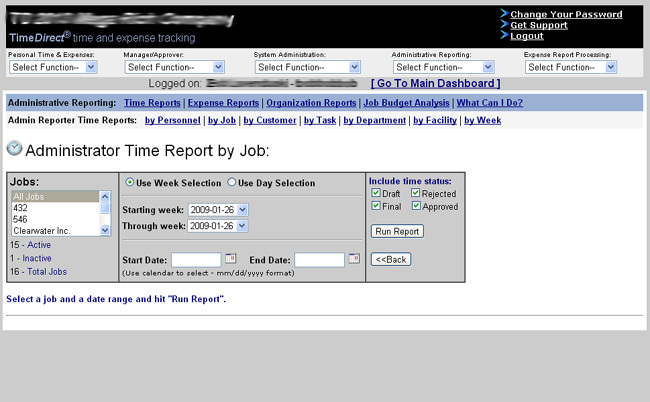 Run personnel expense reports by person, job, customer, task, department, and week. You can also select a weekly summary layout, or choose a time frame between any two dates. Organizational reports allow you to list details pertaining to jobs, customers, personnel, tasks, expenses, as well as personnel by facility, personnel by Approver, and personnel by Department. When setting up jobs, you will by able to establish billing targets or limits with your customers. The Budget Analysis report will compare your Approved billable time and expenses with these established amounts. This is a great way to keep track of billable hours and expenses with respect to your customers’ expectations and limitations. When creating personnel accounts, you will be able to assign a billing rate (to the customer), as well as a pay rate (to the staff member). Both of these are done at the TASK level in TimeDirect. The administrative reports run to and from a specific day will show you a comparison of billing amounts vs. pay amounts to discover which activities and customers are profitable, and which are not!